The son and two granddaughters of Raymond Downey, a four-time veteran of the race who died in the 9/11 attacks, will compete Sunday. The legacy of a beloved father and grandfather — also an FDNY firefighter killed on Sept. 11, 2001, who had completed four New York City Marathons by the time he died — will serve as inspiration and motivation for two Deer Park sisters and their uncle in the Sunday trek through the five boroughs. “I just get emotional thinking about it,’’ said Gina Tortorici, 25, a teacher at W.F. Mount Elementary School in Stony Brook, of running the New York City Marathon like her grandfather, Raymond Downey, did so many times. Tortorici said she and her sister Nicolette Tortorici, 23, have trained for the race since July on the same Deer Park streets as their grandfather when he prepared for the grueling race. “We are following in his very footsteps,’’ she said. Their uncle did the same when he chose his career. Joseph Downey, an FDNY battalion chief who heads up the special operations unit on Roosevelt Island, said when the expected tough stretches come during the 26.2 mile race, he'll think of his dad. “My father always tried to make a negative into a positive,’’ he said. Even though they were little girls when their grandfather died, his presence is always felt. “I remember my grandfather vividly," Nicolette Tortorici said. "He was hardworking and anytime there was a national disaster, he was one of the first responders." That dedication to others was on full display after terrorists crashed two planes into the World Trade Center. Raymond Downey, 63, and a veteran of 39 years in the FDNY on the last day of his life, headed up the department's special operations command. Downey was last seen at the Marriott Hotel near the Twin Towers, evacuating firefighters onto West Street from the wreckage after the first tower collapsed. When the second tower went down, he was helping a civilian, his son said. 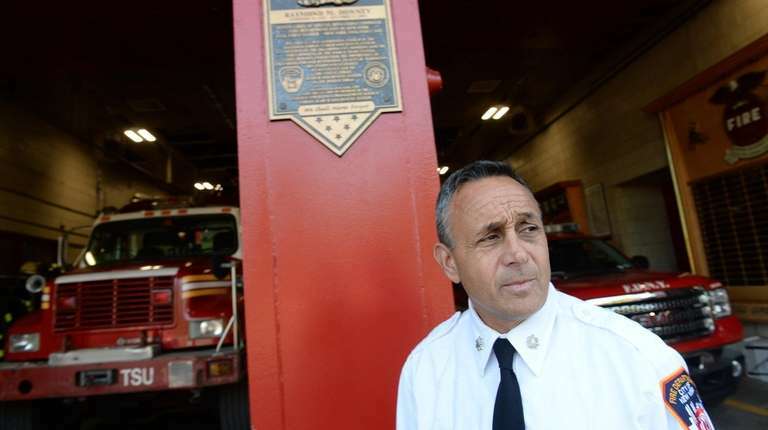 He also was there to lead rescue efforts after the 1993 World Trade Center bombing. Two years later, after the bombing of the Alfred P Murrah Federal Building in Oklahoma City, again, it was Raymond Downey in the rubble, leading rescue efforts. In a tribute to Downey's legacy and his love of running, his family founded the Raymond Downey Forever Running 5K Run/Walk held annually on Father’s Day in Deer Park. The event has raised nearly $1 million for student scholarships as well as nonprofit programs supporting the FDNY, family members said. 17 years after his death, Downey's son and granddaughters will summon his memory when the race is at its most challenging.